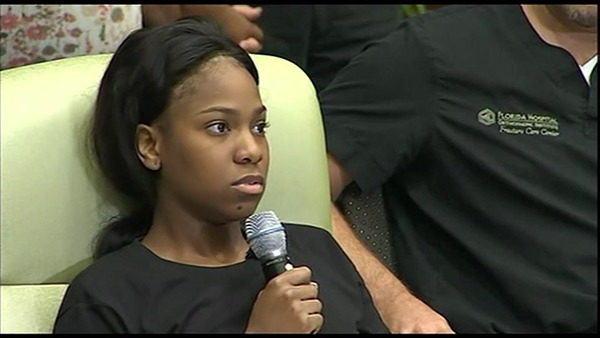 ORLANDO, FL -- The college student from Philadelphia, who was shot and wounded in the Orlando nightclub massacre, spoke to the media on Tuesday, and began with a powerful poem she wrote about her ordeal. "The guilt of being alive is heavy," 20-year-old Patience Carter said, describing her swirling emotions following the incident that she survived, but so many others did not. Philadelphia native Patience Carter reads a poem she wrote about her ordeal during the Orlando massacre. Carter said that she and her friend, 18-year-old Akyra Murray, actually made it outside of the club shortly after the shooting began early Sunday morning at the Pulse nightclub. However, they couldn't find their other friend, Tiara Parker, so the two young women went back into harm's way to find her. Murray, a recent graduate of West Catholic High School, would not make it back out alive. "I was speaking to her mom and she told me to not feel guilty, God has his plan," she said. Carter said that once inside, they found Parker and all three hid in a bathroom stall with a group of other people. Soon the gunman, Omar Mateen, walked in and opened fire. Carter, Parker and Murray were all hit. She said the gunman left, but later came back to make the 911 call in which he told operators he pledged his allegiance to ISIS. He then asked if there were any black people in there, Carter recalled. When one person said yes, she said Mateen replied "This is about my country, you guys suffered enough." Patience Carter of Philadelphia describes her ordeal during the massacre at The Pulse nightclub in Orlando. Once they heard police outside the walls, she said Mateen backed up toward the stall and opened fire again, hitting two more people. One of those people was right behind Carter. Carter said she was told that the person used their body to shield her. The SWAT team broke through the wall and shot Mateen, and Carter said an officer picked her up. Before that, however, she picked up Murray's cell phone, believing she would be able to give it to her friend later. Carter said bullets shattered her right femur and also hit her left leg. She said she didn't know about the left leg injury until she was told about it by medics in the ambulance. Carter then concluded by saying, "I'm still here."